Charlie Chan is apparently stabbed in the back, but it is soon apparent that he is assisting a film crew with the technical details surrounding the accurate portrayal of a murder. The actress who "stabbed" Chan is Sybil Adams, one of the stars of the production. As filming is about to resume, it is discovered that Sybil is missing. Chan notes a film gossip column he has found that mentions a possible love triangle consisting of Sybil Adams, Pietro Pinero, the film's director, and Howard Richards, the producer. Inside Sybil's dressing room with his father, Barry Chan discovers an envelope containing a key and a note from Pietro inviting Sybil to come to his villa. Meanwhile, the elder Chan finds a circled surgical supply advertisement for a specialized wheeled conveyance. Chan and Barry then visit the store which sells the item found in the advertisement. The shop owner informs the detective that Sybil had ordered and paid for the wheeled device, the most expensive one of its kind, which was then delivered to a man named Don McGruder. With Barry posing as one confined to a wheelchair, father and son pay a visit to Mr. McGruder at his cottage in the countryside. Chan tells McGruder that his son would like to have a new chair like the one McGruder recently received and he would like to see it and try it out before making the actual purchase. Upon entry, Chan and Barry note the rack containing many rifles. McGruder is angered when Chan mentions the store owner's comment about a woman ordering the special chair to which Barry adding that she had a voice like Sybil Adams. Chan, seeing a painted portrait of McGruder as a Chinese mandarin, mentions a performance of a play by an English repertory company in Honolulu five years earlier in which an English actor had played such a part in a play called The Green Dragon. McGruder, rifle in hand as he sits in his wheelchair, takes aim at a target and fires. The loud report sends Barry jumping out of his wheelchair. The shot also brings Sybil Adams hurrying in from another part of the house. It is revealed the Mabel Ross, McGruder’s middle-aged housekeeper, had called Sybil after McGruder, who, it is also revealed, is secretly married to Sybil so as not to harm her box office appeal. Mabel adds that McGruder could always give Sybil a divorce, but he is too fond of Sybil's money. Howard Richards and Pietro Pinero are summoned by Charlie Chan McGruder's home. Upon hearing from Chan that Sybil has been found, Howard Richards is incensed to learn of her marriage to McGruder, mainly due to the fact of McGruder's condition, all of which will, he feels, hurt the chances of the success of his film. Chan asks to Richards whether his anger is possibly the result of the information from the gossip column mentioning the suspected love interest involving the actress and the director and producer. As everyone leaves, Chan and Barry are startled by the sound of a gunshot. Racing to the next room, they find McGruder on the floor, having fallen from his chair to avoid the shot that was fired at him. Chan calls the police. Chan’s friend, inspector Duff questions Mabel who does not hide her resentment for Mr. McGruder. She tells him that the only reason Sybil is with him is because he became paralyzed when he saved the actress from a theater fire in Tokyo. Stating, "Sometimes best way to catch fish is not to disturb water," Chan suggests that Inspector Duff allow the film crew and actors to resume shooting the movie, adding that it may be a good idea to allow Mr. McGruder to participate as well. Back at the movie set, director Pietro Pinero gives Sybil instructions for the next scene. At the conclusion of the scene, she is to emerge from hiding and shoot an unseen character off scene. Pietro suggests that she aim and shoot the gun, which is loaded with blanks, at him as he will be standing in the correct position beyond camera range. However, when the time comes for the actress to shoot the gun, there is only a click, ruining the scene. An angry Pietro calls for the prop man. Asking the prop man for the gun, McGruder opens it and notes that the firing pin is bent, stating that he will fix it. At this point, Inspector Duff has returned with a collection of medical reports on the condition of Don McGruder. All of the reports agree that McGruder's illness is psychological; physically there is nothing wrong with him. Meanwhile, McGruder, using the prop man's tools, has repaired the faulty gun. The prop man tells McGruder that if the gun still does not work he has two more in his prop storage that currently contain live bullets that can be exchanged for blanks. The scene is filmed again. As before, Sybil appears from hiding, takes aim, and shoots. This time the gun works, but instead of shooting a blank, Pietro is struck a real bullet and the actress faints. Under the care of Mabel, Inspector Duff and Barry come in with the good news that the bullet only grazed Pietro's shoulder and that the director is actually ready to resume filming. As Barry and Duff exit the room, Chan informs them that one of the pistols containing live bullets was reported missing by the prop man. Chan requests that Inspector Duff delay questioning for 24 hours as he has a plan, adding that he would like to talk with Sybil alone. As filming resumes, Sybil, angered at Pietro's forceful direction as well as her husband, McGruder’s insistence that she continue on, quits, adding that McGruder can find himself "another meal ticket." Later, back at his home, McGruder reacts to a comment by Mabel, noting that she has been trying to break up marriage to Sybil. "It's broken already," Mabel adds. 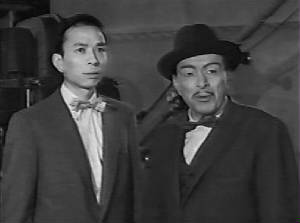 Entering, Charlie Chan shows McGruder a message he has received from a film producer in Hong Kong, asking the detective, while he is in London, to seek our Don McGruder to play the mandarin character which he had so successfully played five years earlier for a film adaptation of the play The Green Dragon. The film maker is also seeking the services of Sybil Adams and will pay very handsomely for their services. McGruder reminds Chan that he cannot leave his wheelchair, but Mabel in turn reminds the actor that his doctors say that there is no reason why he should not be able to walk. McGruder tries to leave his chair, but fails. Sybil then enters, accompanied by actor Carey Norton, to inform McGruder that she plans to file for a divorce the next day. Chan, informs Sybil of the now-lost opportunity to co-star with her husband in the Green Dragon film. Hearing this, Carey mentions that he has always wanted to play the role of the Mandarin – as long as he could co-star with Sybil. Chan indicates that this is a good idea, and McGruder gives his blessing to Carey and Sybil going to Hong Kong together to make the film. Suddenly, Mabel strongly interjects her disapproval of this idea, stating that it was Carey who had tried to kill Sybil's husband, having seen him in the act. She had not said anything earlier because she felt that McGruder was a bad and was only feigning his condition in order to live off of his wife. However, her opinion changed after she had seen him try to leave his chair and then offering Sybil the opportunity to leave him. Chan explains that Carey Norton wanted to eliminate McGruder so that he could then have Sybil for himself. Carey had also tried to have Pietro, who was also interested in Sybil, killed. Carey suddenly pulls a gun on Chan, but McGruder then pulls one himself on Carey who gives up. Inspector Duff, who had been waiting for Chan's signal outside, then enters with two officers to take Carey away. Chan explains that Sybil was only playing a part in his plan, which included a fictitious story about the planned Hong Kong film production. Strengthened by the good news that his wife still loves him, McGruder struggles to his feet, steadies himself, and then walks over to Sybil on his own. Shopkeeper (to Charlie Chan): "Mr. Don McGruder, Ivy Cottage, Lovat, Berkshire." Berkshire - One of the oldest counties in England. Berkshire borders on London to the east. Anger so soon after lunch very bad for digestion. Detective must consider every question as possible key to open door of knowledge. Sometimes best way to catch fish is not to disturb water.